My initial attempt of posting this on ux.se was to attract users to the chat on the hopes that we bring any sort of life to it, - i honestly hope i'm wrong when i say i am skeptical that this question will be having exposure here, nevertheless how can we bring chat to life? Are we maybe able to increase the exposure on the chat room? Incentivize chat users somehow? provide a chat widget on the side of the main page? or any ideas you can think of? When new users arrive to ux.se often they post questions that are completely out of the community standards or the guidelines and one comment that we often respond with, "maybe this question is more suitable for chat". As a new user: why would i in my right mind post my question on the chat when i see that the last message was 26 days ago which btw was indeed a question that never got answered? I'm certain that our modest community size plays a role in how active the chat is, but i'm certain if we try to join and bring life to the chat room we might reflect some positive enhancements on the platform including the quality of questions asked. Chat isn’t supported in the iOS app. 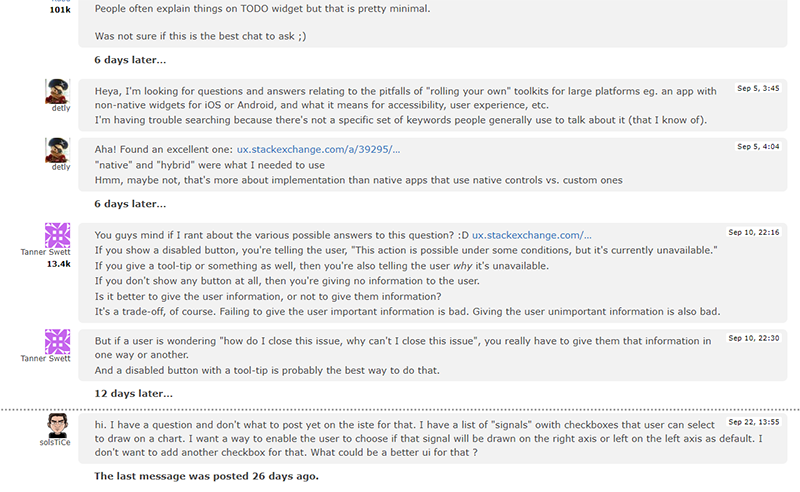 I’ve used Stack Exchange for years and never knew there was a chat room until clicking the link in this question. When I clicked the link I was taken to the mobile website. I don’t see a way to discover chat in the mobile app. What if we relaxed rules on the questions allowed in the Q&A section? I have always understood the comments section on questions/answers to be the chat room supporting those questions & answers. Perhaps having more events in the chat could work, I was thinking of posting a question serie like 'Struggle Sunday' where you have a question with 'would you rather have...' that can be fun to answer / discuss. UX members: you're invited to submit articles to Smashing Magazine! Why are we so uptight? Does the “tools” tag need to be revised?